We are hosting a Skincare Masterclass with Wild Seed Botanicals and Derma Organics on Wednesday 27th February. Meet the Beauty-Preneurs will showcase two indie beauty brands, the products they create and their experiences of being a Beauty-Preneur. 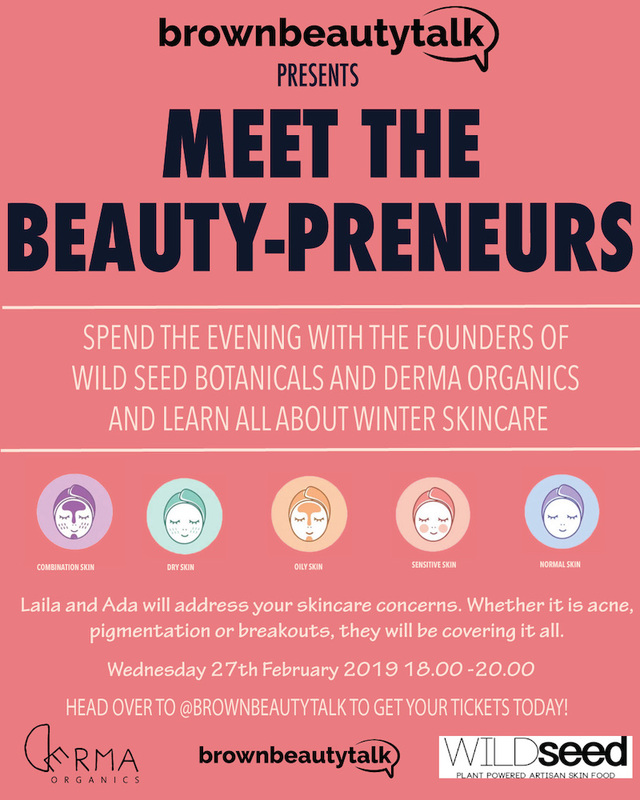 Laila-Jean Washington, founder of Wild Seed Botanicals and Ada Iwuajoku, who created Derma Organics will also address your skincare needs, they will advise you on what to look for when choosing a skincare product, which key ingredients to look out for and which ones to stay away from. Known as popular hair blogger, Neffy FroFro, Laila created Wild Seed Botanicals as a way of helping black women to redefine their beauty. The brand botanical based and handmade in small batches to ensure that they deliver the most potent, raw and purest potion directly from seed to skin. Ada founded Derma Organics as a way of curing her severe skin condition called atopic eczema which covered her from head to toe as a youngster. After being consulted by her friends on skincare issues she realised that she wanted to create a skincare brand that would help people to feel better about themselves inside and out. We will also be teaming up with Cos Box, a new bi-monthly subscription service aimed at brownbeauties in the UK. Cos Box enables women to discover new products and also re-discover staple items. Each specially crafted box includes a minimum of four carefully selected high-quality products from a range of brands to suit the beauty needs of brownbeauties. Every attendee will be given their own curated Cos Box. When you buy a ticket you will have a chance to win a Wine Lovers Box which is a quarterly subscription box that contains two full sized wine bottles plus a surprise gift. We are also giving away a pair of tickets to the Glamour Beauty Festival to one lucky attendee. This exciting event takes place between 8th and 10th March and is a celebration of beauty from hair, skincare, make-up, cosmetics and wellness. Meet the Beauty-Preneurs - Winter Skincare Masterclass takes place on Wednesday 27th February from 6pm.